At the heart of every modern smartphone lies an operating system, the software that runs all other applications on your phone. 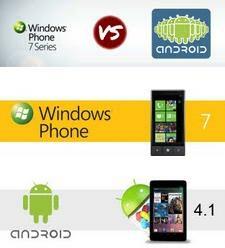 The way in which an operating system works is probably the most important factor in deciding the success of a phone. With a number of new operating systems being brought out to push smart phones in a new direction, many people aren't sure which provides the best service for users. Though this is an important question, largely due to the way in which different features, interfaces and designs will appeal to different people. However, we can let you know what we think are the best and worst features of these operating systems and let you decide for yourself. Below we have taken an extensive look at the benefits of both Android and Windows mobile operating systems to try and find out which one is best. The Android operating system was developed by Google and members of the Open Handset Alliance. It is brilliant piece of open source software. The fact that it's open source means that the ongoing development of the operating system is shaped just as much by users as it is by professional developers. This makes it hugely customisable. In terms of the applications for Android phones, there are a huge variety available and Android has now overtaken the iPhone operating system in terms of the number of free apps users can download. Mainly thanks to the open source design, Android has the most rapidly expanding app store and will soon overtake all other operating systems in terms of the amount of apps available. Android has a number of fantastic features, including a brilliant contacts merging function. The operating system merges all your contacts from email, Facebook, Twitter and phone accounts wirelessly and efficiently, meaning there's no messing around searching for friend's information. Finally, Android boasts an impressive remote control VNC (Virtual Network Computing) function that allows you to control a computer system remotely, via the internet. One of the newer operating systems on the market, this is the successor to Mobile OS and a potential challenger to Android and Apple's iOS. Windows have attempted to reflect the current shift in smartphone use from the business world to everyday consumer use in this newest release and, by and large, have done a very good job. Windows has recently announced a partnership with Nokia, which should see this new operating system rolled out across a greater number of phones in the future. Windows 7 has had some problem with their apps so far, but it is important to remember that the operating system is still young and very open to development. The main concern at the moment with apps and the operating system is that they don't feel integrated enough, though this will come with time. The keyboard on Windows 7 seems extraordinarily small at first, but does allow for surprisingly quick text entry. Finally, Windows 7 offers a user interface that is incredibly easy and intuitive to use, making it a delight to pick up and play with. The main thing to remember with Windows 7 is that it's still early days and any bugs or disappointments are sure to be ironed out in the near future.